ODS file format (.ods file extension) is the Spreadsheet file format of openoffice and staroffice programs. Openoffice is the opensource free alternative for Microsoft Office. However, excel still remains the most popular office suite. If you ever receive or download an openoffice spreadsheet, it is not straightforward to open it in Microsoft excel and would need a special MS office extension to be installed. 3. Select the output format you desire, either xls or xlsx. If you have the pre 2007 office versions it is better to use xls though the preferred version if xlsx. 4. 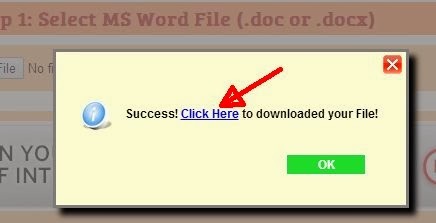 Click on the convert button and a popup will be shown with the link to download the excel file. Recently, I got a document (Microsoft Word format) from one of my friends which had some interesting data in a table. I intended to plot some graphs and do some analysis on the data and hence wanted to copy the table into excel. I searched for an automatic tool to do the conversion for me and found an interesting tool. The instructions to use the Word to Excel Conversion is explained below. 2. Select the upload button; a dialog opens to select the file on your computer. Select the Microsoft word file (both doc and docx supported). 3. Select the output excel file format. The application allows to save the data both in the old xls format and the new xlsx file. In order to preserve as much formatting as possible, select the xlsx format. 4. Click on the convert button; a popup will be shown with a link to download the excel file. Right click and choose save as to download the file to your computer.